NBC’s victory in the most recent measurements provided by the Nielsen company means it has won bragging rights for three weeks so far this fall, with CBS also winning three weeks. Fox won the week during the World Series. For the season as a whole, CBS is averaging 9.1 million viewers in prime time compared to NBC’s 8.9 million, which is the closest NBC has been in 17 years, Nielsen said. NBC’s ability to stick close with its rival will be tested after the football season. 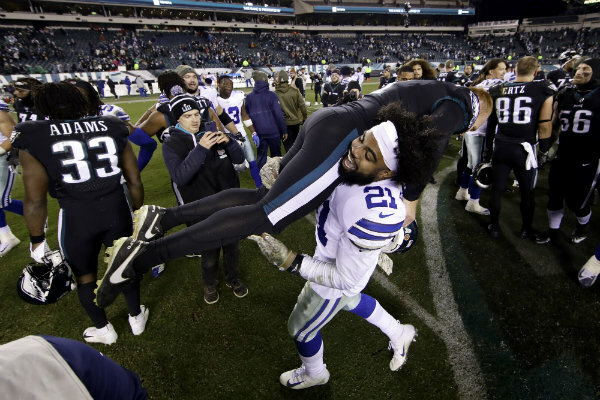 The Sunday night game between division rivals Dallas and Philadelphia this weekend reached 20 million viewers, far more than the next most-watched event, also a pro football game. Fox News Channel outpaced all of the networks covering the midterm elections last week, with its peak hour coming between 9 and 10 p.m. ET. For the week, NBC averaged 7.1 million viewers. CBS had 6.8 million, Fox had 5.3 million, ABC had 4.6 million, Univision had 1.4 million, ION Television had 1.3 million, Telemundo had 1 million and the CW had 900,000. Fox News was the week’s most popular cable network, averaging 3.25 million viewers in prime-time. ESPN had 2.98, MSNBC had 2.3 million, Hallmark had 2.07 million and CNN had 1.68 million. ABC’s “World News Tonight” topped the evening newscasts with an average of 8.3 million viewers. NBC’s “Nightly News” had 8 million and the “CBS Evening News” had 5.9 million. Below are primetime viewership numbers compiled by Nielsen for Nov. 5-11. Listings include the week’s ranking and viewership. 3. “NFL Pregame,” NBC, 13.63 million. 4. “The Big Bang Theory,” CBS, 12.85 million. 5. “60 Minutes,” CBS, 12.71 million. 6. NFL Football: Tennessee at Dallas, ESPN, 12.04 million. 8. “Football Night in America,” NBC, 10.14 million. 9. “NFL Pregame,” Fox, 9.72 million. 10. “NFL Post-Game,” Fox, 9.32 million. 11. “The Voice” (Monday), NBC, 9.02 million. 12. “Blue Bloods,” CBS, 8.97 million. 13. “Chicago Med,” NBC, 8.42 million. 14. “Chicago Fire,” NBC, 8.25 million. 15. Election Coverage, 9 to 10 p.m., Fox News Channel, 8.1 million. 16. “Mom,” CBS, 8.1 million. 17. Election Coverage, 10 to 11 p.m., Fox News Channel, 7.94 million. 18. “God Friended Me,” CBS, 7.87 million. 19. “Survivor,” CBS, 7.7 million. 20. “Hawaii Five-0,” CBS, 7.53 million.